Pershing 46: an evolution with the Fulvio De Simoni / Cantieri Navali dell' Adriatico signature and a way to review from scratch stilling rules and living and performances parameters all of it topped by superior quality. 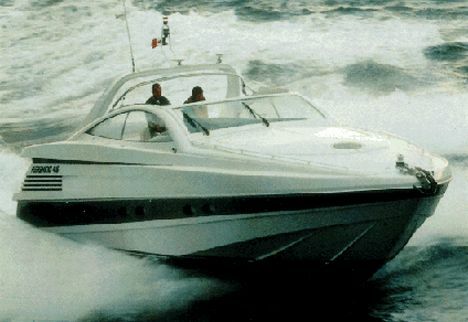 This is a boat that in spite of the foul weather close bordering the full gale prevailing at the time of the trial, has been capable of delivering and exhilarating performances and at the same time, giving the feeling of sailing in complete safety. This is no easy task for an open cruiser where both internal and on deck spaces has been studied for a quiet and sophisticated navigation. The name Pershing on the other hand, means precisely this: a powerful and fast sailing with perfect maneuverability and trim in every condition. O particular beauty are the external spaces, the cockpit with the ample sunbathing area aft, the "U" shaped dinette with the vertically electrical driven table and the steering station with two ergonomic seats personalized with the series' logo. The swimming platform is of a new design and teak wood lined, while the deck fittings and mooring cleats are of very good and strong manufacture. Of special mention is the deck profile styling with lines all leading to the cockpit foreward end. Below deck the Pershing 46 offer a living space well beyond the impression given by its external appearance: the two cabins are both fitted with double beds, the bathroom with a shower box and the spacious dinette that can be adapted into a sleeping quarter. The biggest surprise is the aft with a cabin and a bathroom of exceptional size and separate access from the cockpit's sunbathing area: a cozy arrangement ensuring privacy. An innovative and sophisticated boat ahead of its time and simultaneously mindful of the great success that Pershing boats have obtained in the past. Average miles range, at a given rpm, is obtained dividing the total fuel capacity (2100 liters) for the "liters/mile" corresponding to the entered rpm. Plotted fuel consumption is declared by the engines' manufacturer: tuning of the engines, weight of persons, stores, etc... on board, hull conditions and propeller type can effect the real fuel consumption. Construction material: fiber reinforced plastic with sandwich construction. Fore deck: electric windlass with anchor and chain, fairleads and cleats, grabrail, hatch, sunbathing area with cushions. Cockpit particulars: sunbathing area with central access to the aft double cabin, U shaped dinette with table, wet bar to the port side with sink, pilot and co-pilot seats, completely fitted steering station, cold/hot water telephone shower. Swimming platform particulars: split level layout with teak deck, fully hidden hydraulic actuated gangway and swimming ladder. Superstructure and windows material: stainless steel and aluminum deck hardware, toughened glass windshield and lateral windows. Lay-out and main features: fore owner cabin with double bed, wardrobes and side settees. 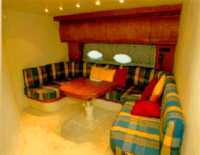 separated owner's bathroom with double access and separated shower; main saloon with convertible dinette, fully hidden galley area and main electrical board; guest cabin with double bed; aft cabin (with access from the cockpit)with twin beds, wardrobe, separated bathroom with shower; custom upholstery and carpets. Steering station: pilot and co-pilot seats, hydraulic steering with wheel, throttles, compass, engine monitoring instruments and gauges, depth sounder, clock, log, double station VHF, GPS with plotter, fully hidden electronics board. Chart table: to the steering station's port side or on the cockpit's table. Galley: fully hidden and placed to the port side complete with stainless steel sink, two burners cheramicglass stove, refrigerator and freezer, storage space and 6 persons dinner set. Standard equipment: electric fire and chain washing pump, 3.5 KW gen-set, horn, shore line connection, water heater, weather station, stereo system. Optional: air conditioning: 21.000.000 Lit; Color TV set (11"): 2.990.000 Lit; leather covered sofa: 10.500.000 Lit; cockpit canvas: 2.800.000 Lit; bow thruster: 16.780.000 Lit. Seakeeping: the Pershing 46 has performed an excellent trail highlighting the hull's superb seakeeping capabilities achieving a remarkable top speed always ensuring the required maneuverability. Visibility: excellent, even with the sun canvas rigged. Interiors: elegant, modern and bright with excellent habitability and privacy. Steering comfort: the steering station is well conceived. Its ergonomic design include all the necessary equipment. Chart table: ample and accessible. Galley: elegant and with quality fittings. Bathrooms: spacious and well equipped: remarkable the round shower box. Engine room space: excellent distribution and safe. Electrical plant: the main electrical board is rationally positioned and built according to the most restrictive rules.